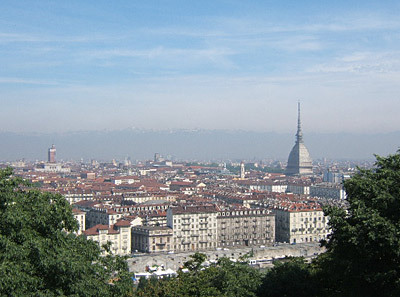 Turin, one of the vertices of Italian industry and capital of the automobile, was founded as an old Roman colony with the name of Augusta Taurinorum, assuming important beginnings in the 13th Century, when thanks to the power of the Savoy, was gradually enlarged, until it became the capital of their reign during the 16th Century. The transformation of the City then had other important phases: in the 1500’s, the 1600’s, with the presence of the architect Guarino Guarini, and in the 1700’s with Iuvarra. The most important historical moment of Turin, goes from 1861 to 1865, when it took on the role of the first capital of united Italy. The urban ambience is very different with respect to that of other Italian cites, in that it was characterized by the wishes of the Savoy, giving it a quite severe French appearance: large roads which meet at right angles – the most important is the central Via Roma – and spacious squares of regular geometry – amongst which, should be noted, the Piazza Castello and Piazza Carlo Felice. Turin has a very active cultural life: there are publishing houses, there’s the seat of one of the main Italian newspapers and seats of prestige for scientific and technical studies – the Polytechnic and the University. As a exhibition centre, the most famous is definitely the Egyptian Museum – the third most important in the world – but we must also note the Sabauda Gallery, the Gallery of Modern Art and of recent foundation, the Agnelli Art Gallery at Lingotto - the ancient seat of Via Nizza of the FIAT car company, which dates back to the 1920’s and which aroused admiration from LeCorbusier – and the Museum of the Cinema fitted out in a fascinating way, and inside one of the symbols of the City: the very famous Antonelliana Mole, 167 metres in height, projected by the architect Antonelli in 1863, as synagogue for the City. An architectural itinerary across Turin, should take into consideration the very central Castello Square, on which the Palazzo Madama faces, dating back to the 17th Century – this curious name comes from fact that it was the residence of Madame Reale Maria Cristina, regent of Carlo Emanuele II of Savoy – its Baroque façade is from 1721, and work of Filippo Iuvarra. The Regio Theatre, also faces onto the square, with its 18th Century façade, but with a very modern interior from 1973; the Castello Square passes neighbouring Piazza Reale and the Cathedral, to which is annexed the very famous Chapel of the Sacred Shroud – a creation by Guarino Guarini, built between 1668 and 1694 and now under a meticulous process of reconstruction, following a terrible fire – inside, the Shroud of Turin is preserved and considered to be, one of the most important Christian relics. The perspective architecture of Via Roma is also noteworthy, with the “twin” Churches of S.Carlo and S. Cristina, to close the perspective scenery: along the route, in Piazza S. Carlo, the Science Academy Building faces onto the square, and houses the aforementioned Egyptian Museum and Sabauda Gallery – contained paintings by Beato Angelico, Bronzino, Mantegna, Veronese, Tintoretto, Gentileschi, Carracci, Reni and Tiepolo, amongst others.